Not only is it a delicious spice but it has been praised for its medicinal uses for thousands of years: Cinnamon. Ceylon cinnamon is known as the true cinnamon however, the most commonly referred to cinnamon we use today is Cassia Cinnamon. Cinnamon is actually the innermost bark of the Cinnamomun Verum tree. When harvested the bark is peeled away from the tree and curl creating quills or more commonly known as cinnamon sticks. However, you can get cinnamon in many forms such as sticks, powder, capsules and many more ways. Cinnamon is high in fiber and calcium which helps with Colon health. Fiber and calcium are essential to one’s diet to maintain or improve a healthy digestive system. Cinnamon also has powerful antioxidants that help with controlling blood sugar. It is used quite often with people struggle with diabetes and often take cinnamon capsules. 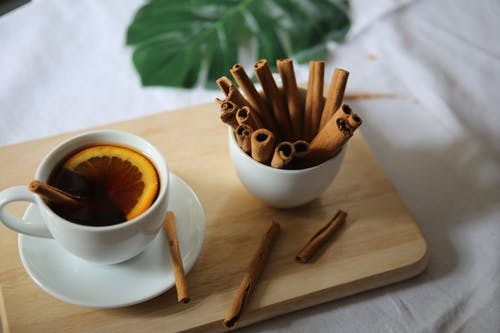 Cinnamon is also a natural anti-inflammatory which can be a great natural alternative to many over the counter medicines. Cinnamon is one of the oldest spices known to man, and for ages, it has been used for healing, trading, and cooking. If you’re looking for a natural alternative that is beneficial to the body I would highly recommend. Here is an awesome recipe for cinnamon tea. This is a great way to start out one’s morning, with a cup that packs a healing punch that will keep you going through the whole day. Let steep for 8-10 minutes. Looking for more health-related articles? Check out our Fill Your Plate blog where we post 3 times a week. Looking for some recipes to make the whole family happy? Check out our recipe section. This entry was posted in Allergies, Cooking, Diet Tips, Fill Your Plate, Focus on Agriculture, Food, Food Facts, Health Tips, Healthy Eating, In the Kitchen, Recipes and tagged Cinnamon, health tips, Healthy, Natural, Spice, Tea. Bookmark the permalink.